We’re trying to get back in the habit of Sunday morning breakfast. I’m just not a morning person. J finally got tired of waiting around 10:45 and came in to wake me up. She didn’t ask if I wanted to go to breakfast. She told me we were. I’m still slowly marking breakfast joints off my list. Not being a breakfast person, it’s hard for me to pick one that stands out, but I still had one on the list that has gotten pretty high marks from friends. 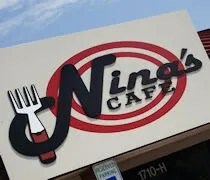 Nina’s Cafe is on West Main Street between Arlington Street and Prairie Avenue. If you don’t know where those streets are, it’s in the shopping center with Tiffany’s Wine and Spirits, Saffron, and Zooroona. The first thing you’ll notice about the place is that it’s tiny. They only have 45 seats and that includes a counter in the middle of the space. We pulled into the shared parking lot and didn’t see a lot of cars so I felt pretty good about not waiting. Then, we walked up to the door and found several people already waiting for a table. There’s a sign that tells you to go to the counter to put your name in. They asked if we would take a place at the counter if it opened up. We’re not picky. We just wanted to eat. The surprising thing about the trip was that tables were not being turned quickly. There were at least four couples in front of us and a couple more called ahead which got them tables before any of us. It’s not that people weren’t leaving. The waitresses were just not getting tables cleaned up after people left. At one point, there were three tables waiting to be cleaned and no one had even so much as looked at them. As I’ve mentioned before, my mom is a waitress and turning tables is vital to her haul at the end of the day so it surprises me that no one seemed to get in a hurry to get those tables cleaned and get waiting customers into those seats. With two tables still sitting empty yet not cleaned off, one of the waitresses started calling out names and asking if they would want to sit at the counter. The two couples in front of us both declined so it eventually came to us and we jumped. We took a seat on the dining room side of the counter and waited for a couple menus. One waitress set down menus and silverware then another came back for drinks. I got a Coke while J got a large OJ. Another surprising twist at this point when the waitress set down the drinks but didn’t ask if we were ready to order. She turned around and started to talking to another customer on the other side. It was a friendly conversation not about breakfast so it was a little discouraging that we were sort of being ignored while we were ready to order. A few minutes later, the waitress turned back around and we were more than ready to put the order in. I was leaning towards the steak and eggs, but didn’t feel like spending the money. Instead, I went with a three egg cheese and chorizo omelet. On the menu, the prices are for a six egg omelet, but I wasn’t quite that hungry. They have an option for a three egg for a buck fifty less and even that was more than I could eat. 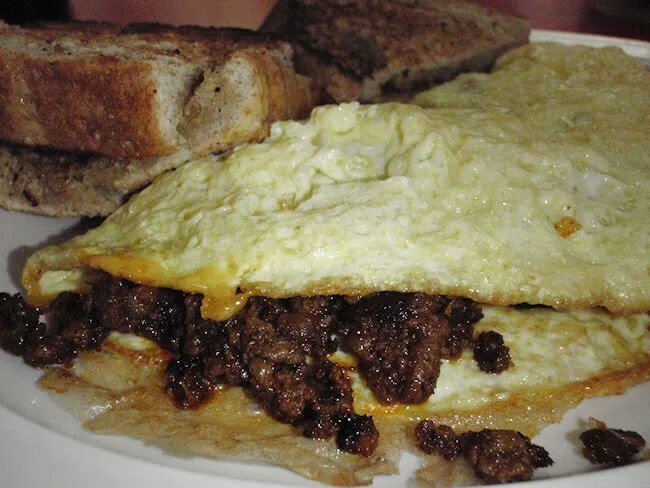 The omelet was overflowing with a healthy portion of a spicy chorizo sausage and cheddar cheese. The omelet was delicious and I was very happy with the fact that it was more meat than egg. The plate came with toast which is a delicious, light, fluffy home made bread that is lightly buttered and toasted. I was a little bummed at first that I didn’t go with the steak and eggs, but in the end, I’m very happy I went with the omelet. I’m a big fan of chorizo and it’s such a perfect fit inside an omelet. 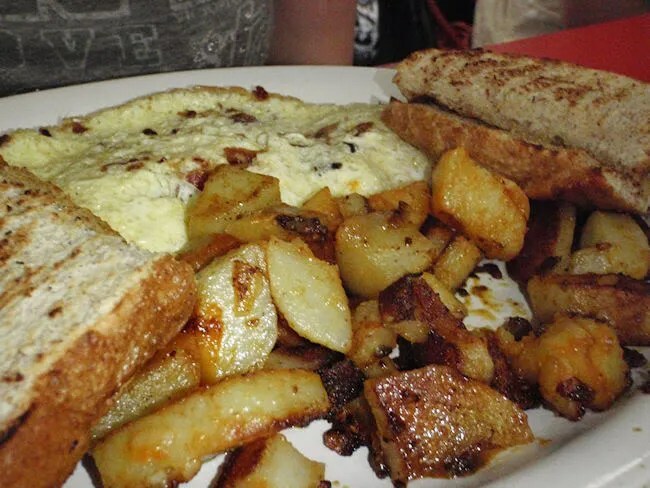 J also went with an omelet but she opted for the bacon and cheese three egg omelet also with the wheat toast. Like me, she was very happy to see the filling in the omelet consist mostly of bacon. While she liked the omelet, what she really liked was the toast. She was still talking about it several hours later wondering out loud if there was someplace to buy the bread they used. In addition to her omelet, she also got an order of Spicy Nina Fries which were cubed potatoes pan fried and tossed with a spicy blend of spices. She really liked those and while she offered to share, I would have had to have acted fast if I wanted more than the one I tried. The flavor was fantastic, but I’m not a fan of potatoes that taste like potatoes. I’m weird…I know. Our bill was a little under $20 and after the initial issues of waiting for tables to be cleaned off and waiting to order, the meal moved along pretty quickly. The lady sitting next to me commented that it looked like the kitchen was short, but the kitchen was quick. I don’t think it was five minutes after we ordered that our plates were being set down in front of us. From my uneducated perspective, I would say they were short a busboy some someone in front of house. Overall, the meal was delicious and I’ve read so many reviews about how great service was so maybe we hit a bad day. It happens and it’s nothing that would keep us from going back. 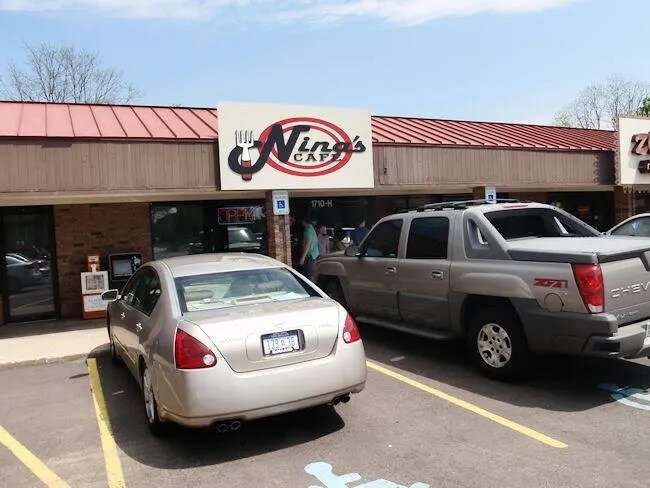 Nina’s ranks up there as one of the best breakfast joints in town. Maybe next time I won’t be groggy and I’ll actually look over the rest of the menu because there are a lot more options than the typical breakfast fare. My biggest suggestion is that if you go on a weekend, call ahead for sitting. I don’t think it will matter what time you try to go, there will most likely be a line. Definitely call ahead. It makes a huge difference. My wife and I are almost regulars there and on first name basis with one of the servers. We’ve never noticed a problem with turning the tables or inattentive servers. The counter is probably the best place to sit because it is usually more open and you get to interact with more people if you so choose. As far as the menu, I would recommend the Juevos Rancheros w/ chorizo added, Joel’s downhome favorite, the roast beef hash with a side of hollandaise, or the eggs “benetine” (an off the the menu combination of eggs benedict and florentine). It’s also usually very easy to find a buy one entree get one free coupon. Glad you got try this one! The service thing surprised me because great service is one of the things I read about over and over. May have been a bad day. I was actually very close to ordering the Huevos Rancheros. I love that they have chorizo as an option on so many dishes. Nina’s bakes home maid raisin, white, and wheat bread! Thank you for your thoughtful review and beautiful pictures of our food. We appreciate all comments (positive or no) about our Cafe. All feedback is helpful to us and appreciated. We strive to give the best possible service at all times, but as your post noted, don’t always achieve this goal. We have noted on occasion that tables weren’t bussed and reset as quickly as they could be. We will work to do better! Please come back to see us again.